We believe that, if given the right opportunities and tools, people have the ability to find their own woodworking and design style; a formal education is not necessary to turn creative ideas into something tangible and rewarding. Our goal is to teach technique and to show the many ways tools can be used, even by unconventional methods. We intend to send you home excited by your own ideas and the skills learned over the weekend. Check the “Schedule” page for which piece is offered each workshop weekend. The use of templates and routers has been something that changed the way we've built and even designed furniture. It not only simplifies the process but also perfects it. For us, it's made the process quicker and more consistent. For you we believe it will make furniture designing and building more approachable and less intimidating. The Festool Domino has revolutionized the way we build our furniture. It's the most valuable and used tool in our shop. It takes the guesswork out of joinery and allows you to focus on all the other time consuming steps of joinery such as clean cuts, clamping, and gluing. The third important step to creating clean, strong joints and learning proper clamping and glue up techniques. This can be a stressful part of the process, but the more you prepare for it, the more confident you’ll be. The Festool SurFix, in our opinion, has not gotten the attention that it deserves. We have been using this at Jory Brigham Design for years now and we love it! It's a simple, yet beautiful, finish with durable and long-lasting results. A lot of people tend to complicate the process of working with concrete. We have found that it is a very forgiving and easy medium to work with, and feel it should be completely approachable. By using GFRC and finishing techniques, you'll be able to find the best way to tailor concrete work to your style. No woodworking or welding experience required. 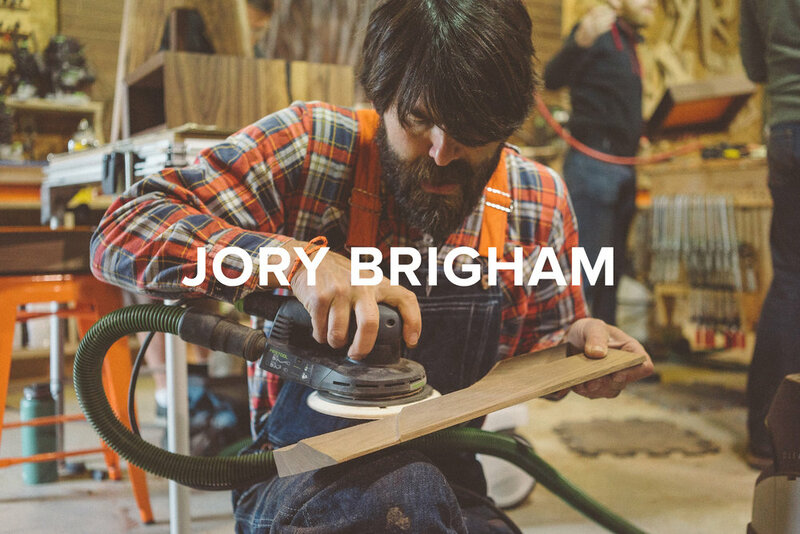 Our newest course, this session focuses mostly on metalworking, taught by phenomenal Cleveland welder Jason Radcliff of 44 STEEL, with a side of woodworking from Jory Brigham. Participants have the choice to build with walnut or teak (for outdoor use, at an extra cost of $150), as well as the option to powder coat the steel with one of several colors or leave it raw. Structurally, the integrity of a metal joint is stronger than wood. When used in conjunction with wood, metal can not only provide great balance but can also open the doors to design options. In a nutshell, Jory believes that the more materials we learn to work with the more we can perfect our own unique style. For each welding course, the Jory Brigham Design Workshop imports Jason Radcliff (of 44 Steel and Framework) from Cleveland to take on what might be considered nearly impossible: teaching people TIG welding in just one day. It's Jason's unique perspective and philosophy that take the intimidation out of the mix. Although TIG welding is a bit more complex than MIG welding, its principles provide the capabilities to work with almost any metal, and weld a cleaner and stronger line with less cleanup. Attendees will also have the option to powder-coat their metal work on-site to witness how easy the process really is, as well as how easy it is to bring this skill home.